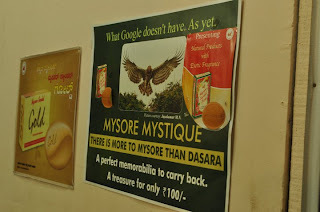 The Mysore Mystique poster has been on my mind today and so I cant help writing a line about it! One of the most amusing posters I saw at a market stall in a fair at Mysore, Karnataka. 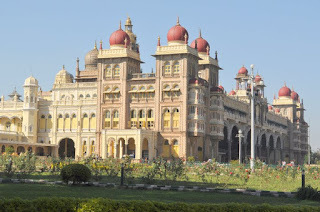 After Hyderabad, Mysore was the other city that we explored in our India trip in December 2010. We flew to Bangalore and then went to Mysore in the Volvo bus which runs between the two cites hourly. It was a good 3 hour ride and we spent most of the time catching up on much needed sleep! We stayed at the Ginger Hotel which is a pretty decent hotel in terms of rooms and amenities, however I was not impressed with their food. I hoped to find authentic South Indian food but they served the broader category of Indian food which mostly has North Indian dishes. On the first evening I ate to my heart's content dosas at an authentic South Indian udipi place. I have to mention that I am a big fan of South Indian food. We then went to see the majestic symbol of the city - the Mysore Palace. The palace was closed so we took pictures from outside. Since it was Friday, the palace was not lit up it its most famous way. 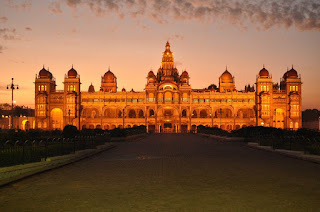 However the dim lights with colorful sky at sunset offered some amazing snaps of the palace! We then headed to a fair across the street from the palace. It was very crowded and had stalls selling a variety of items ranging from clothes, footwear, domestic appliances and articles to locally made handicraft and decorative pieces and a variety of food of course! We booked a cab for the whole of next day to explore the tourist attractions of the city. 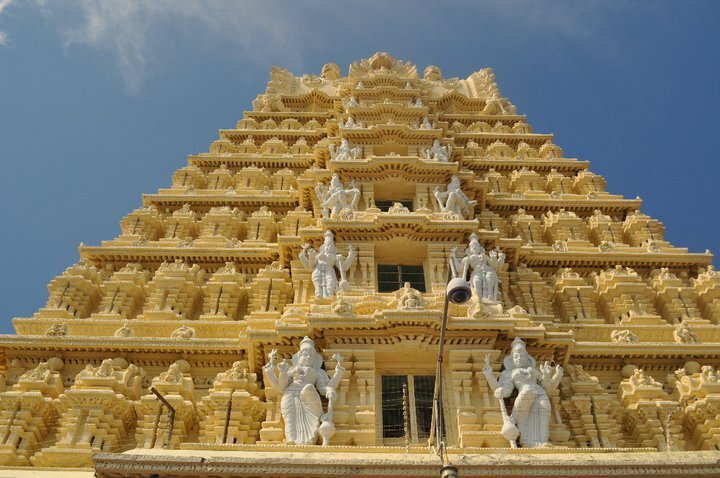 We started with the Chamundi temple on the Chamundi hills. The temple had amazing sculptures on its entrance. 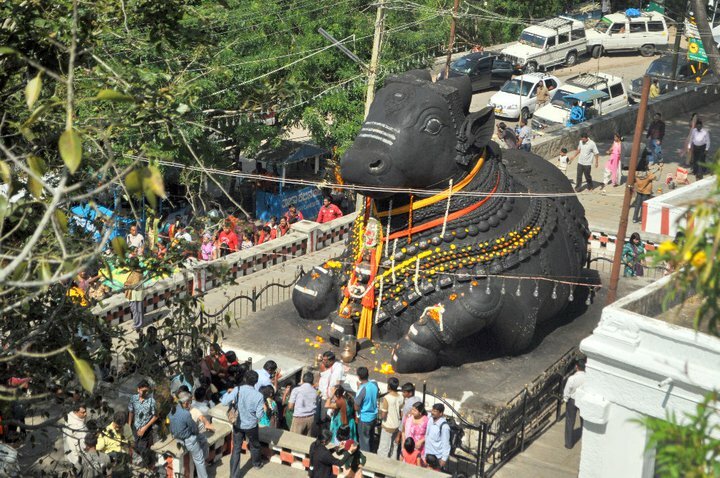 We also visited the huge Nandi (the bullock) statue in the same neighborhood. On our way downhill we stopped at a location that offered a spectacular view of the city and the palace domes standing out from the rest of the buildings. We then went to Karanji Lake. This lake was a pretty usual one, the only attraction there was a bird sanctuary that had a variety of beautiful birds with unusual colors! I cant name most of those except the peacocks and the white peacocks. We then took a short stop at the Montogomery Church which was well decorated for Christmas festivities. 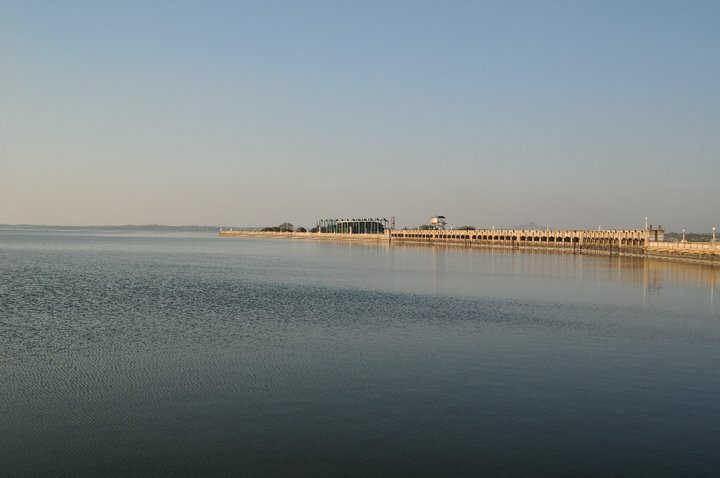 We headed to Vrindavan gardens and on the way we stopped at the scenic KRS dam. 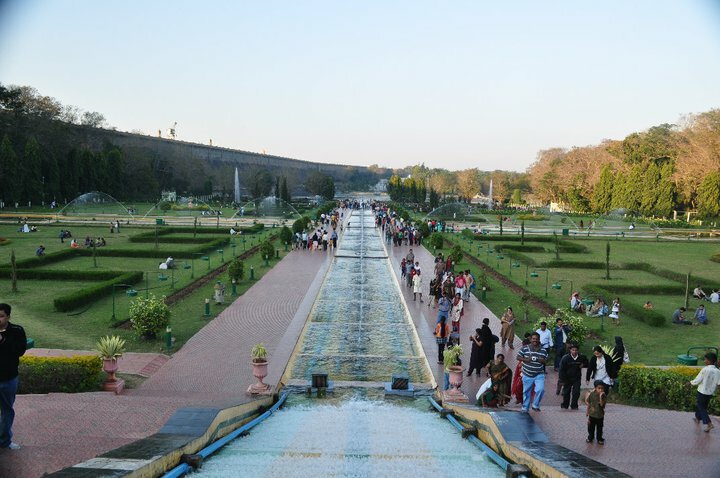 The gardens are huge and the layout is perfect and symmetric. The variety of fountains and the effect of colored lights after dusk is fascinating! 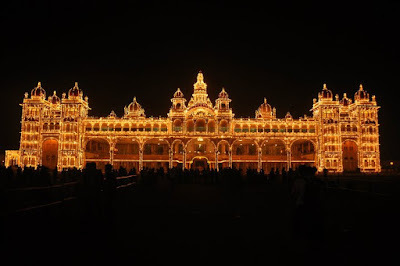 We then headed back to the palace to witness the palace lit with few thousand bulbs. The sight of the palace was almost like a fairy tale book coming to life. The next day was our last day at Mysore and we planned to set off for Bangalore after lunch time. 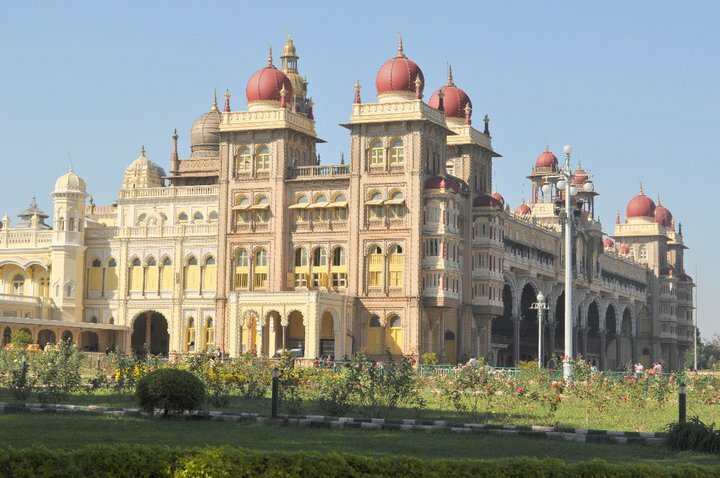 We spent the morning again at our favorite place in the city - Mysore Palace! This time we took a tour of the palace from inside. 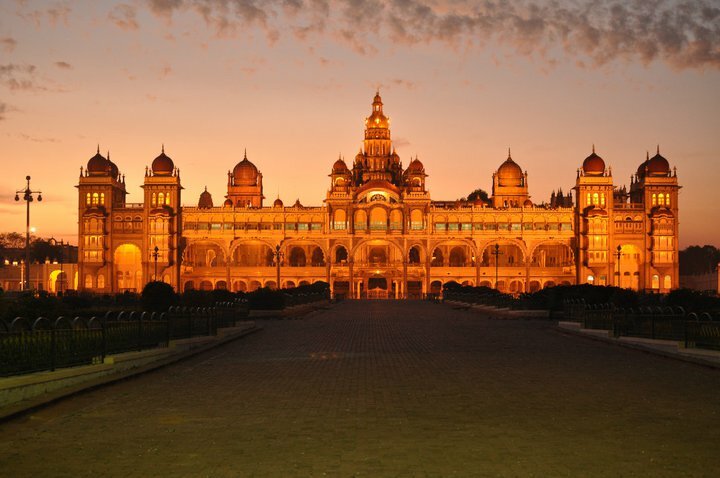 You have to see it to believe the lavish interiors, abundance of gold and silver architectural structures and precious paintings and carvings and gems adorning the palatial walls. We rented an audio guide and enjoyed every bit of the description of the palatial rooms that took us back in time to the Wodeyar era. We brought back with us memories for a lifetime and delicately carved wooden frames portraying a famous chariot scene of Arjun and Krishna from Mahabharat! 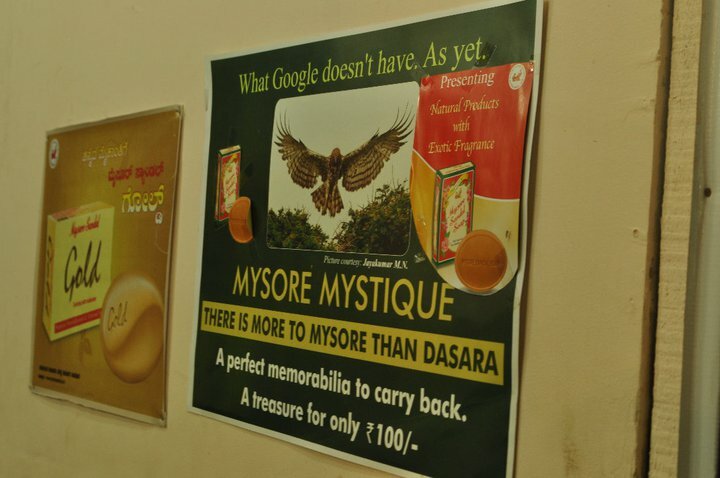 We also bought a delicious sweet Mysore Pak, and the popular South Indian coffee to cherish the Mysore memories even later in its tasty offerings.